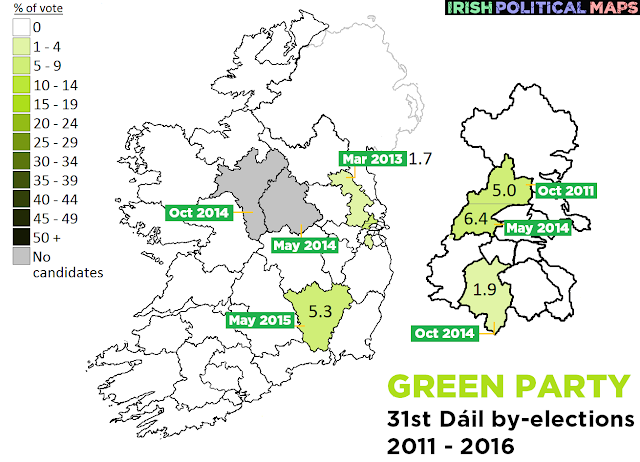 There were seven by-elections during the lifetime of the 31st Dáil. 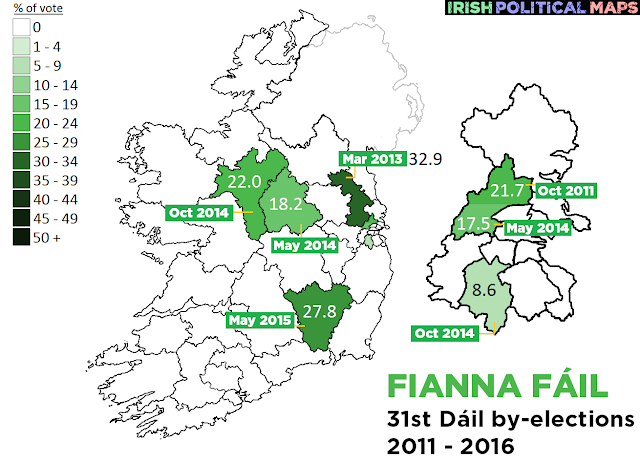 The first, in October 2011, saw the late Brian Lenihan's seat taken by Labour's Patrick Nulty in a resounding success for the party and a further blow for a wounded Fianna Fáil. 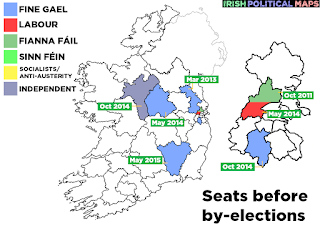 The last, in Carlow-Kilkenny in May 2015, saw Fianna Fáil take back a seat they lost in the previous general election. 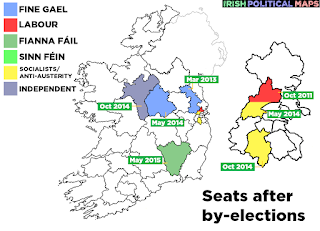 Some by-elections saw no change of seats - Fine Gael retained Meath East and Longford-Westmeath while Luke Ming Flanagan's seat in Roscommon-South Leitrim went to another independent, Michael Fitzmaurice. 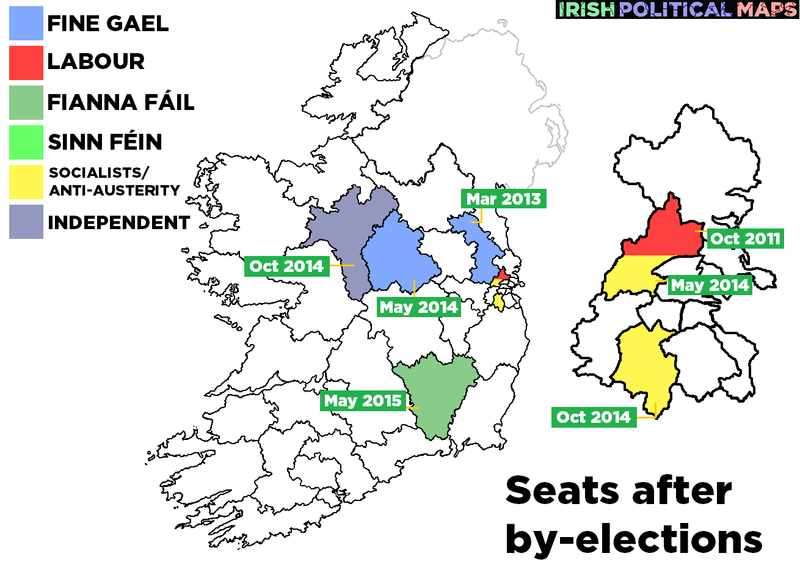 Below are maps of the parties which contested more than one of these by-elections. 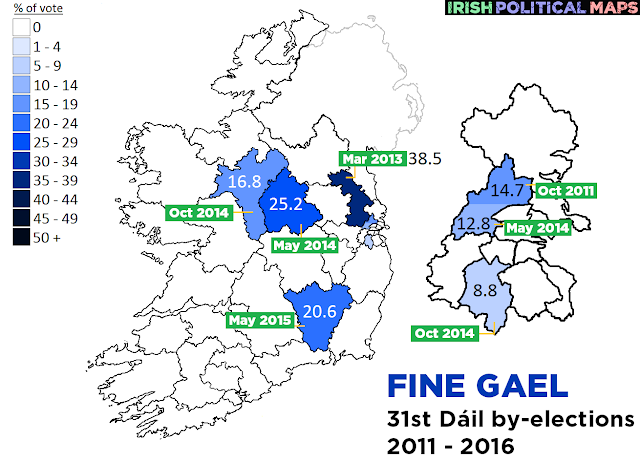 The results over time show the rise in the popularity of Sinn Féin and the Anti-Austerity Alliance (formerly the Socialist Party) and the decline of the popularity of Labour and, to a lesser extent, Fine Gael. Comparing the two Dublin West results is particularly interesting. 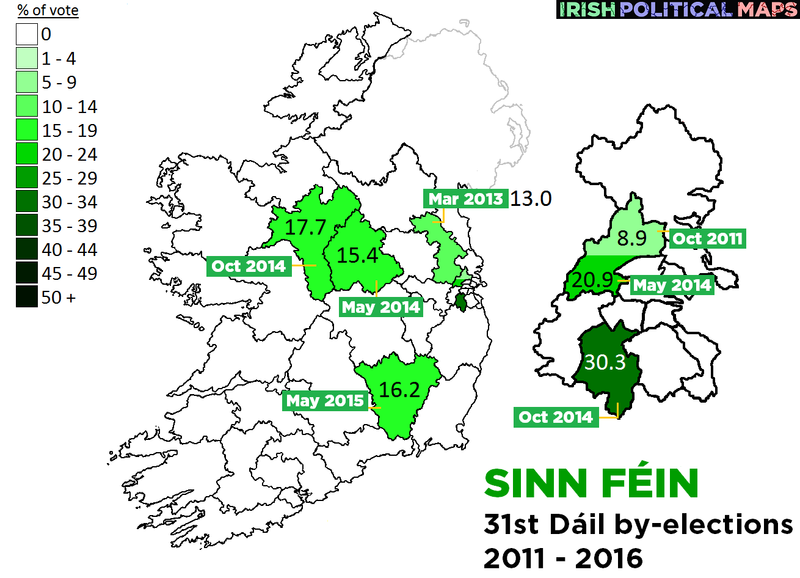 Nulty resigned from the Dáil and was replaced in 2014, with many of the same candidates running as in the first by-election, but the vote shares they received in both cases are quite different - not least for Sinn Féin's Paul Donnelly. 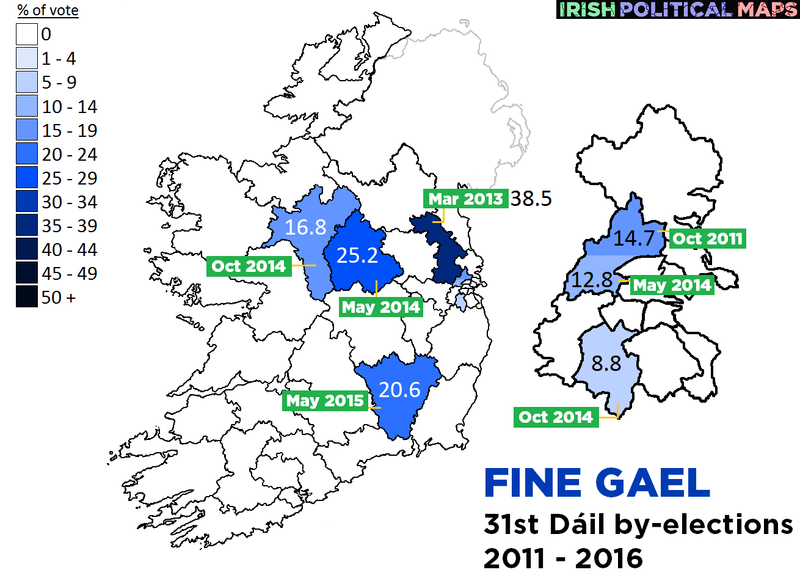 Fine Gael kept Meath East and Longford-Westmeath after the deaths of TDs Shane McEntee and Nicky McFadden, but the party later lost Brian Hayes' seat in Dublin South West and Phil Hogan's in Carlow-Kilkenny, after both men went to take up new posts in Brussels. 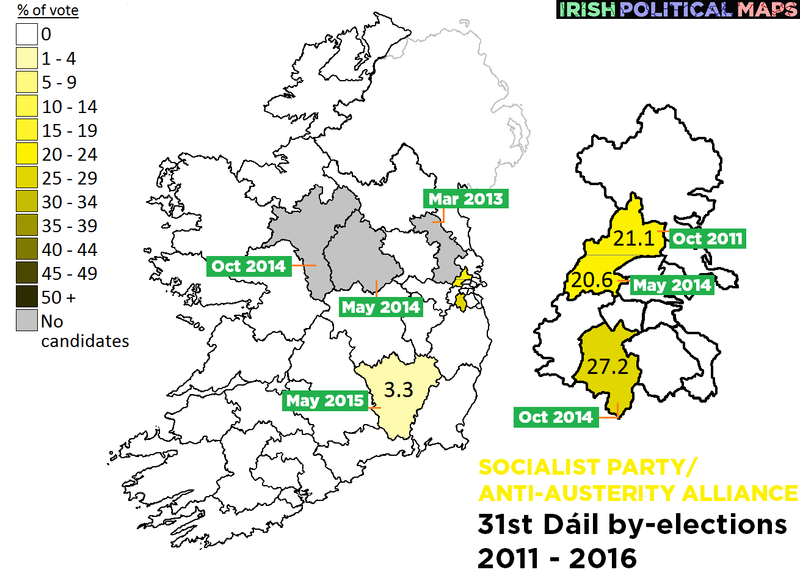 The party's 8.8% share in Dublin South West was a bad sign for the party's tenuous support in the south western Dublin constituencies. Labour's huge success in taking the late Brian Lenihan's seat from Fianna Fáil in Dublin West turned sour when victor Patrick Nulty resigned in 2013. Replacement candidate Lorraine Mulligan returned an extremely poor result, coming ahead of only three other candidates. In the last by-election in Carlow-Kilkenny, the party polled behind Renua Ireland. 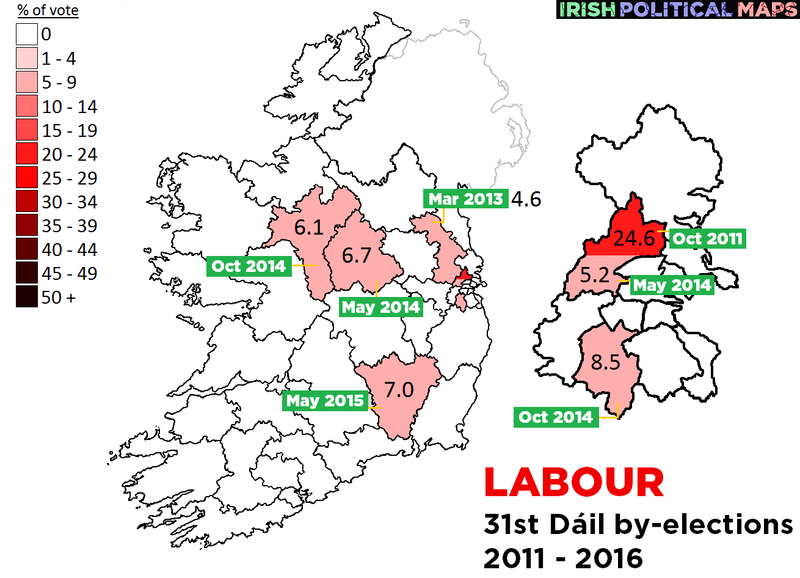 With Labour's support plummeting according to opinion polls, it looks like the 2011 Dublin West by-election may be Labour's last big success, for now at least. Brian Lenihan's death meant that for the first time since 1926, nowhere in Dublin was represented in Dáil Éireann by Fianna Fáil. 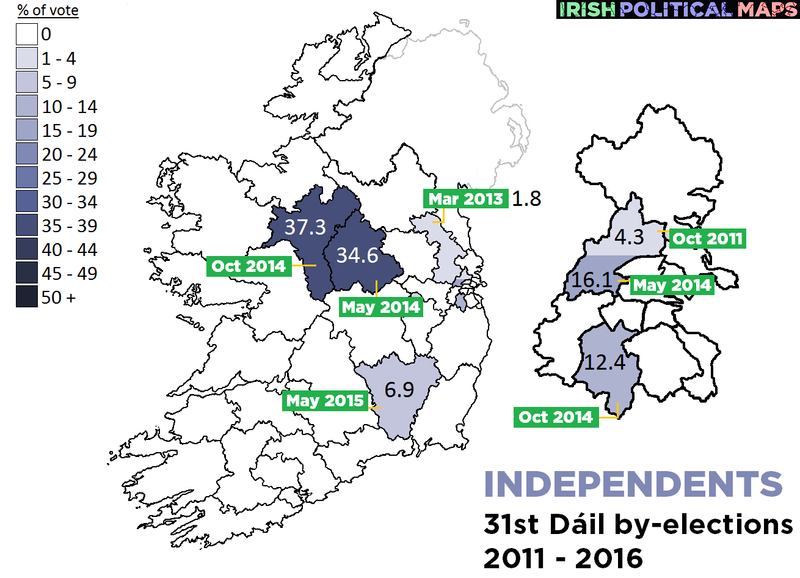 The party failed to take back the seat in any of the three Dublin by-elections, though the performance of candidate David McGuinness was strong in both Dublin West contests. His resignation from Fianna Fáil before the general election may harm their chances there. Some good showings in Meath East and Roscommon-South Leitrim proved the party still had life left in it after the general election, and Bobby Aylward's victory in Carlow-Kilkenny gave Fianna Fáil a new confidence as they prepared for 2016. 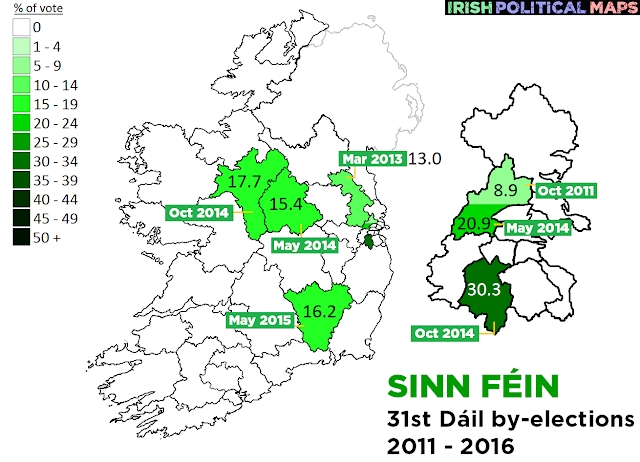 Sinn Féin did well in 2011, and they're on course to do even better in 2016. The difference in the two Dublin West results - with the same candidate - illustrate how much the party's profile has risen. Dublin South West candidate Cathal King topped the poll there in 2014, and only lost the seat to the AAA's Paul Murphy on transfers on the eighth count. 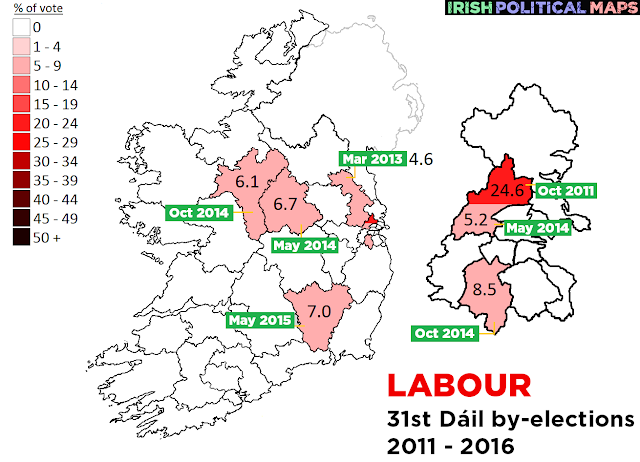 Ruth Coppinger's strong third place showing in Dublin West in October 2011 meant she was bound to do well when Labour's vote collapsed there in May 2014. Paul Murphy performed strongly in Dublin South West and took the seat from the Sinn Féin candidate on the eighth count. The Green Party lost all of their seats in 2011, but some of their results in these by-elections indicate that, with the benefit of transfers, they may manage to return to the Dáil in the future. It's always a mixed result where independents are concerned. 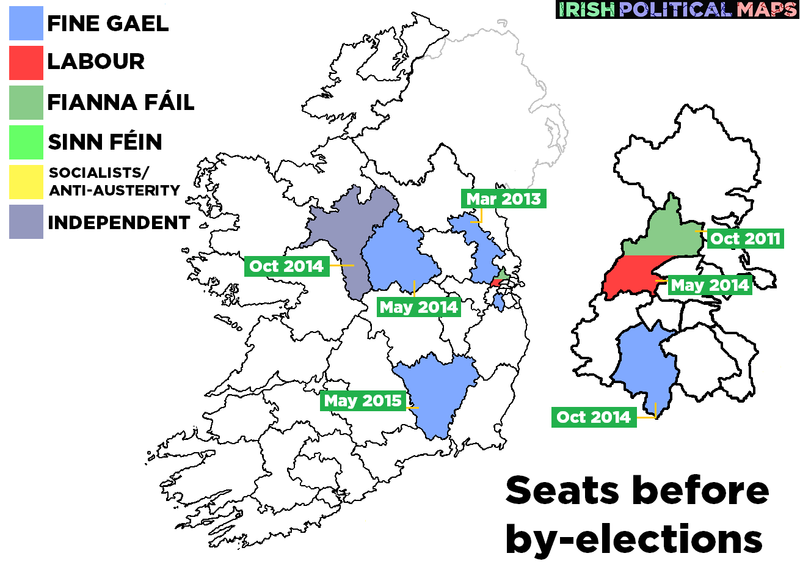 Luke Ming Flanagan's seat in Roscommon-South Leitrim easily went to Michael Fitzmaurice in 2014, and earlier that year the combined vote of five independent candidates - many of whom are running in 2016 - added up to a large amount against the parties which ran there.